PLUS SIZE MODEL: LOREN MONARES | "THE NEXT LEVEL"
Erzullie Icon and Plus Size Model, Loren Monares, has been one of the most recognized plus size models in the Philippines. Bagging both local and international fame, this Erzulliesta is opening up about how she handles the opinions, keeping her identity intact and what she hopes that industry will open up to next. #1 You have been in the industry for almost 5 years and counting! How proud are you of your run in the fashion world? I’m proud of myself because even if I am a plus size, I never held myself back from doing what I love to do and follow my dreams. Even if society has set some standards and ideals, I never let that stop me from pursuing my passion. And given that I am plus size, doing things which society thinks can only be done by regular size people actually gives me more accomplishment. #2 What are your recent accomplishments so far? As a plus size model, I’m so blessed to be able to expand my network and be given a number of opportunities which made me reach out to the bigger plus size community. 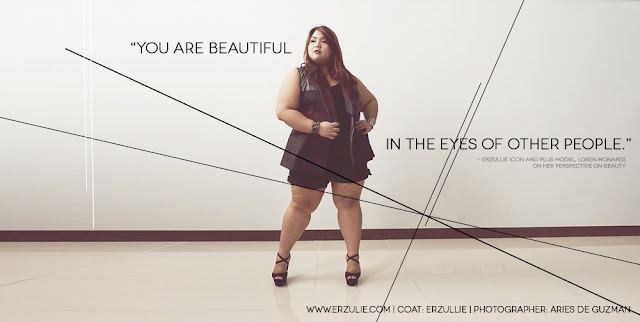 Definitely 1st on my list would be my role in the Erzullie Fierce Plus Size Clothing brand. To be their icon for 4 years is such a big blessing for me. In fact, through Erzullie, I was discovered by other projects as well. To name a few, I got my exposure in ABS CBN via Minute to Win It, Showtime and Mutya ng Masa. I also had some modeling exposure in TV5 morning show. Apart from modeling, my doors opened to acting, which is my first love by the way. I took on a main role in the Southeast Asian Tropfest short film festival entry in 2013. And my recent blessing was to be featured in an international plus size magazine called Skorch as the first Asian plus size model to be featured. #3 How do you deal with all the stress of the projects? I feel so blessed to be given all those opportunities. I’m so thankful for a very supportive family and friends and also my Erzullie family for the unconditional support even to my projects outside the brand. With this, I feel that I should be giving it back by sharing the lessons I learned to others. 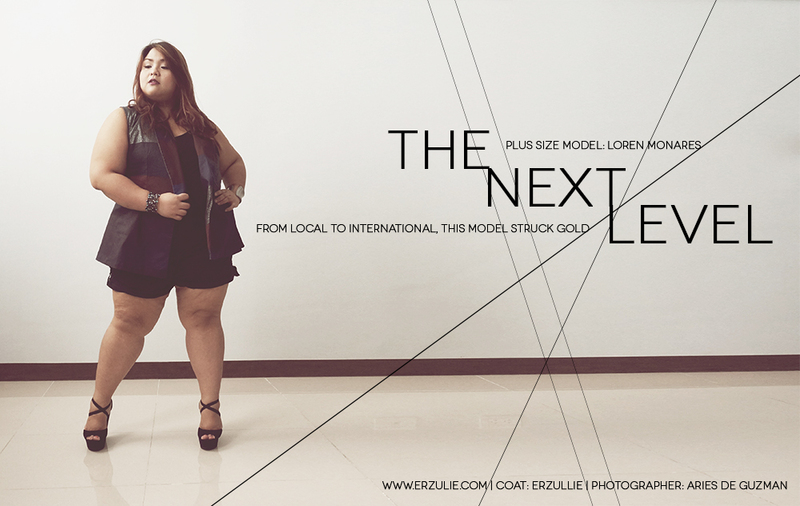 With these opportunities comes my responsibility to drive the advocacy of plus size empowerment. #4 Do you think you have been able to achieve something through these projects? I think somehow I was able to inspire the plus size people that I met through my accomplishments. It gave them hope that even if we are plus size, we do have our space in the fashion industry. Hopefully my accomplishments help us in our drive towards plus size empowerment, showing the world that what really matters is our talents and skills. 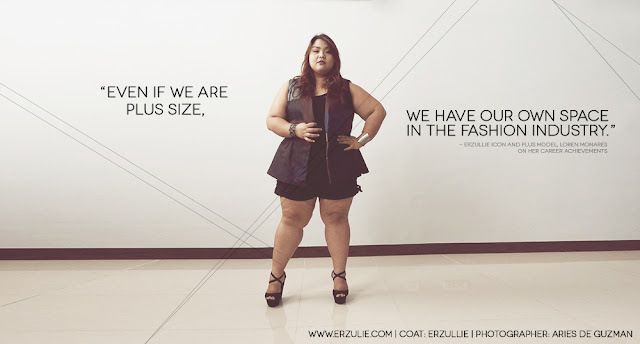 #5 How do you view the future of the plus size category in the fashion world? I believe the fashion industry has been slowly embracing plus size. That’s compared to 4 years back when I was still starting. You’ll see more and more plus size brands opening in the market. 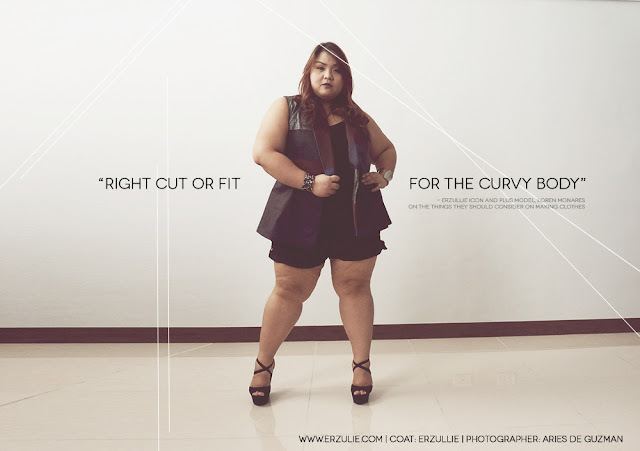 More and more plus size models and personalities are given spotlight. More and more venues or activities are out to cater or give exposure to plus size people. But I think we just need to continue the momentum until such time that we can really say that we have reach our goal of having that fair or equal treatment or opportunity for plus size. #6 Do you think there should also be a fashion line about plus size men? Why or why not? Oh yes please! I do have plus size male friends and they do go through the same challenges that we have in terms of finding good clothes. If we feel that there is still not enough choices in the market, I think it’s all the more for men. My brother is also a plus size and he finds it hard to find good pair of jeans or top. 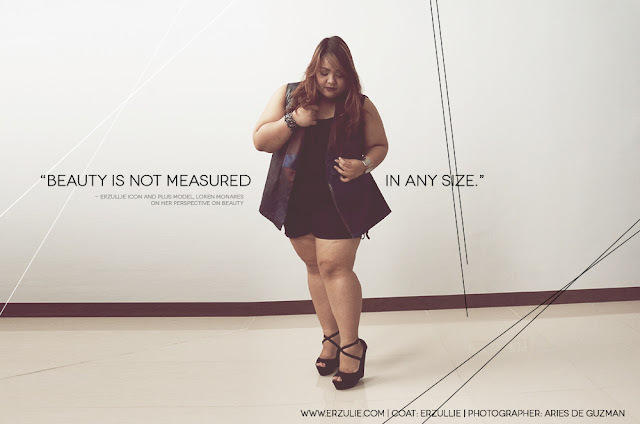 You’ll see a number of plus size clothes now in the market, especially online market, but mostly for women. So I think it’s about time that men are also catered same as women. #7 Do you think other fashion lines and company should include or also consider making a plus size outfit version of their average designs? Why or why not? I’ve actually seen some brands already expanding to plus size of same designs. Why not, right? There are a lot of designs that would also look good on plus size body. Although in my own opinion, it should just be the right cut or fit for curvy body. There are designs or cut that would look good or not for plus size. It’s important to consider that. #5 Speaking of that, how do you view yourself as a plus size woman? I see myself as someone who values inner beauty and character rather than the outer appearance. Instead of focusing on my weaknesses and what I do not have, I focus more on maximizing my strengths to achieve my dreams and aspirations. With that, never did I felt insecure about my size and hindered myself from doing what I love to do. And I humbly say that I was able to inspire other people to love themselves and be confident as well. #6 If you got the chance to change something with the way you look, what would it be? Why so? Hhhmmmm, I’m really happy with the way I look now. But if I have to choose one thing that I want to change, that would be to grow taller at least 3-4 inches hehehe. Given that I have ventured into the fashion modeling industry, it does look nicer if you have the height. Although I realized that there are ways on how to position the camera for you to look taller or there are poses that you can do which will make you look taller. Having said that, I’m perfectly fine with my height now. #7 Would you change something about yourself? Why or why not? Nothing… definitely nothing at all. I am happy with the person that I am now. I am blessed with family and friends who support me with my endeavors and advocacy as a plus size woman. I’m not saying that everything is perfect for me, I know my weaknesses, but it’s something that can be compensated by my strengths. #8 How do you define “beauty” in your perspective? Why so? Beauty equates to character of a person. You are beautiful in the eyes of others when you good deed to them. You are beautiful when you have positive outlook in life and you inspire others to think the same. That positivity or good vibes that you share with others is what makes you beautiful. If you have a good heart, then natural beauty will just transpire of you. #9 What’s your best advice for the plus size females out there on how to be strong as a plus size woman? Keep your heads up and never stop believing in yourself. There will be endless challenges that will come your way. There will be instances wherein others will question you and your worth. Always remember to reflect and be reminded of your value and purpose. Again, beauty is not measured by any size nor it’s based on your appearance. Beauty is about having a good heart and inner positivity.